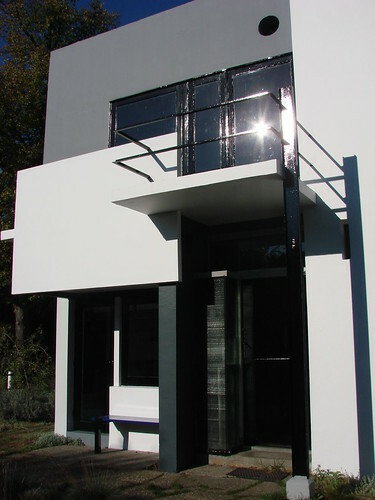 This is the Rietveld-Schröder House. This is the viaduct today. 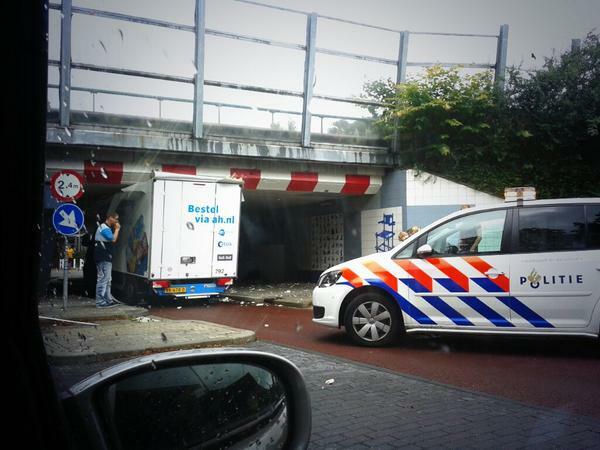 It’s a fairly low clearance and it would seem that the driver of the Albert Heijn (grocery store chain) delivery van didn’t judge the heights well. The driver wasn’t hurt, but the van sure took a beating. A peeled-back can of sardines comes to mind. 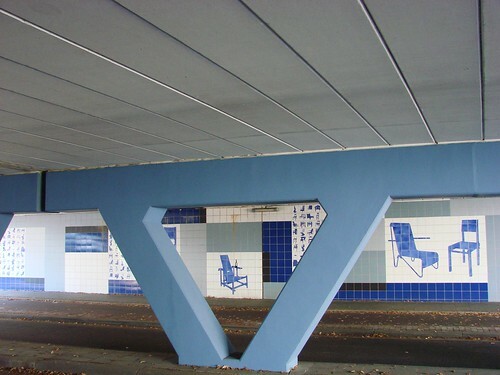 The building of the viaduct, which ruined the view and the intentional openness of the space, wasn’t exactly appreciated by all (particularly Rietveld himself), but at least they’ve since decorated it to acknowledge Rietveld’s work. 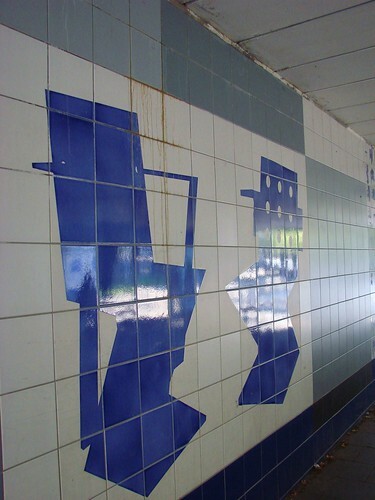 But as Caroline on Twitter pointed out, Rietveld is probably laughing in his grave. 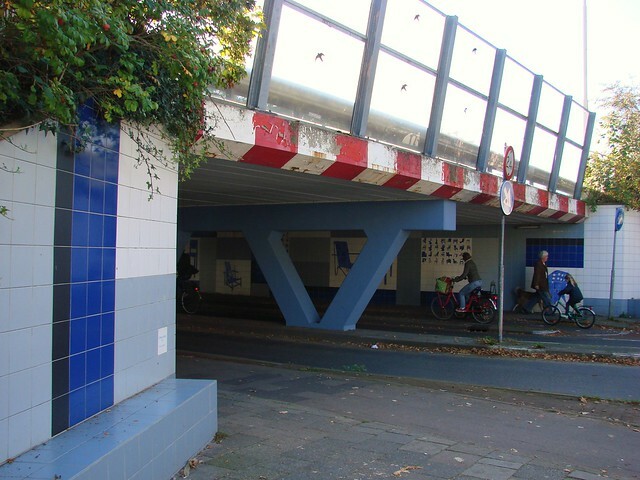 One of the first things I discovered about Utrecht once I knew we would be moving here, was the fact that it was the location of the famous Rietveld-Schröder House. 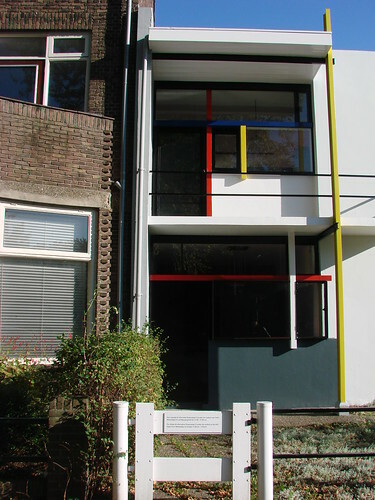 With all the architectural history I studied at university, I was very familiar with this De Stijl house and I was thrilled to know that I’d have the chance to see it in person. Fast forward a couple of years to this past week, when I decided it was time to finally go see this architectural gem. It is, after all, Rietveldjaar (Rietveld Year), so this morning I finally decided to go see it for myself. 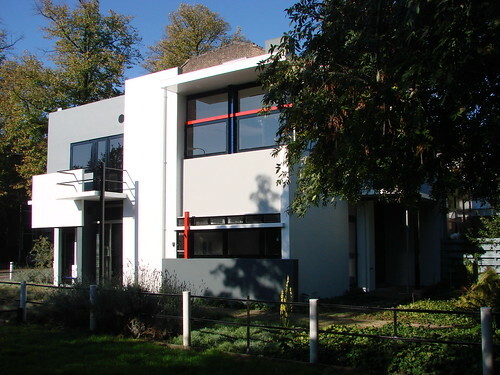 Built in 1924 by Gerrit Rietveld, an Utrecht architect and designer, the house was built for — and designed with the input of — the owner, Truus Schröder, a widow with modern tastes. 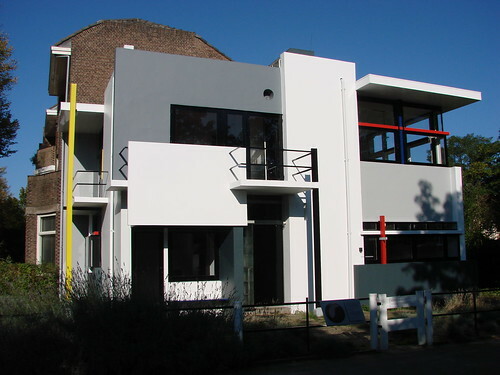 The house, which was named an UNESCO World Heritage Site in 2000, is the only building designed and constructed according to the principles of De Stijl. 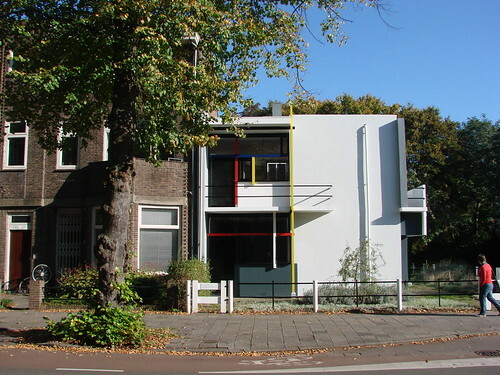 For the record, some of the main principles of De Stijl included a focus on pure abstraction and a simplicity of form and color, reducing all things to basic horizontal and vertical lines, squares and rectangles, asymmetrical forms, and primary colors. Certainly, one of the most famous artists of the style is Piet Mondrian, famous for his black-and-white grid paintings with squares and rectangles of red, blue and yellow. Looking at the Rietveld house, it’s as if one of Mondrian’s painting has come to life and moved into a realm of three dimension. The house itself is a square shape primarily colored in white and grey, with small touches of red, blue and yellow. The lines of the house are straight horizontal and vertical lines, intersecting to create smaller squares and rectangles, while avoiding straight symmetry. The interior of the house, as well, was simple and open, but with movable walls that could change up the layout of the interior space, creating new rooms and flow patterns. You can take tours of the house organized by the Centraal Museum, or if you just want to look at the outside — as we did — you can simply wander around admiring the different views and angles. As I moved around to the side and back of the house, I started sneezing repeatedly. I’m obviously allergic to something growing in that area, because it was an immediate reaction! But a little sneezing never stopped me from admiring a beautiful building! 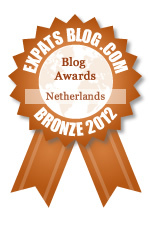 If you can’t make it to Utrecht, you can also take an online guided tour of the house. It’s a lovely area to walk around, just to the east of Wilhelmina Park, which is a gem unto itself. The street on which the house stands, Prins Hendriklaan, is full of lovely architectural surprises, from the St. Antonius Gasthuis to some of the more modern structures on nearby Gerrit Rietveldhof. 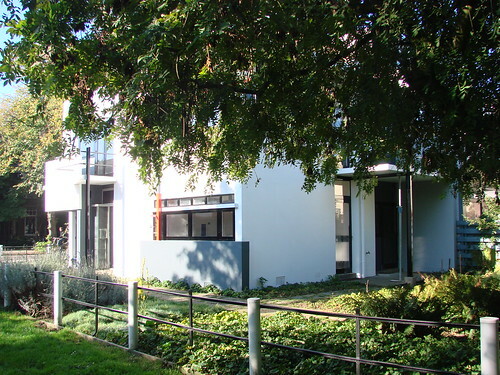 The juxtaposition of the Rietveld-Schröder House against the larger, but more traditional style of architecture makes a visit more than worth it. 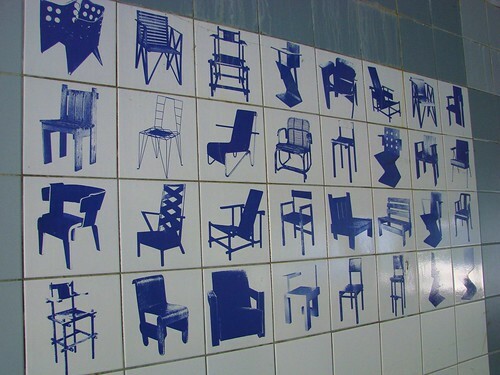 Tomorrow, I’ll tell you a bit more about Rietveld’s chairs.